Bruce Bartlett, former advisor to Presidents Ronald Reagan and George H. W. Bush, discusses his new book about the challenge of fake news. The internet is a minefield of fake news, alternative facts, bogus videos and doctored images — all masquerading as the real thing. The prevalence of false information has become so great it is often difficult to know whether “news” is authentic. Historian, economist and writer Bruce Bartlett’s new book aims to help readers in the vetting process. 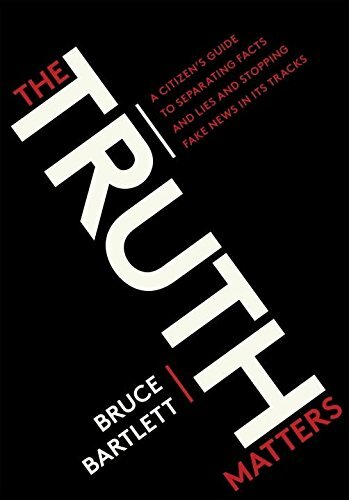 The Truth Matters: A Citizen’s Guide To Separating Facts From Lies And Stopping Fake News In Its Tracks offers advice against bias, and insight into the complex media landscape. Bartlett, a former White House adviser under Presidents Ronald Reagan and George H.W. Bush, is also the author of many other books and articles. He recently joined the Knowledge@Wharton show on Wharton Business Radio on SiriusXM channel 111 to talk about his latest work. Knowledge@Wharton: As a published writer and a former policy adviser, you’ve seen this problem from both sides, correct? Bruce Bartlett: That’s right. That’s why I thought I had something to offer. I don’t consider myself to be a professional journalist. Syndicated columnists don’t count. We don’t do reporting. But I have been a source for a great many stories, so I thought I could talk about the news in a way that I think the average person can understand. Most of the books that I have looked at on similar topics seem to be written for journalism students at universities rather than the average person. Knowledge@Wharton: We are learning more each day about Russian involvement in American politics through the manipulation of social media. The impact on the citizen is as important an issue as anything else right now. Bartlett: Oh, absolutely. It may be years before we get all the truth about this Russian business. But I think it’s interesting that organizations like Twitter and Facebook, depending on the day, they’re either media companies or they’re not media companies, depending on whether they’re trying to cloak themselves in the First Amendment or not. The whole media landscape has changed very radically in the last few years. I’m not sure if readers or journalists have quite figured out what’s going on. Knowledge@Wharton: But it feels like what happens in Washington, D.C., and on Capitol Hill has been the driving force behind all of this. Bartlett: I think underlying economics probably had more to do with it. The decline of print newspapers because of the internet, the effects of 24-hour cable, the effect of talk radio — the elimination of the Fairness Doctrine in 1987 — really opened the door to talk radio and Rush Limbaugh’s success, which led directly to the creation of Fox News, which I think begat a whole media system that now bedevils us. Knowledge@Wharton: What do you see the state of the media now and potentially where we’re heading? Will it get better or worse? Knowledge@Wharton: The first chapter of the book is, “Why the Traditional Media No Longer Serves Our Needs.” Explain what you mean by that. Bartlett: I think what we’ve lost, that we had at one time not too many years ago, is a common understanding of the basic facts of whatever story is in the news that particular day. Remember when there were just the three major network broadcasts in the evening, 30 minutes apiece? You could subscribe to any major city newspaper and get reasonably good coverage of the basic news, whether it was the Vietnam War or Watergate or the other big stories of that era. The problem today is people live in what are sometimes called silos, where they get all of their information from one point of view. You watch only Fox News. You listen only to conservative talk radio. You read only Breitbart and some of the other conservative websites. Unfortunately, these sites are quite biased. A big part of the bias is simply what they choose not to cover. There are lots of stories that you wouldn’t even know about if you got all your information from those sources. To be sure, you could do the same thing on the progressive side if that’s what you choose to do. But I think that there’s now more ignorance about things that people really should know about. Knowledge@Wharton: In this digital age, there is an even greater rush to report the news. That haste has led to instances in which information is not fully vetted or verified before it is presented to the public. How do you see that as impacting this whole process? Bartlett: That’s a very, very serious problem. That the urge to post first and ask questions later is enormous among both the media and the general public. We’re all guilty of linking on Facebook or Twitter to some story that sounded really good just because it had an interesting headline, and maybe we didn’t even bother to read the story before posting. The same temptation arises in the media. Unfortunately, what this creates is a race to the bottom. If you’re a responsible journalist who says, “Hey, let’s wait a second. Let’s double-check these facts. Let’s make sure this isn’t something made up out of whole cloth or Russian propaganda or just a satire that maybe sounds too good to be true,” these are the people that unfortunately lose the clicks and lose the advertising that goes with the clicks. Advertisers don’t care whether the person who read that story or saw that advertisement was reading something completely nonsensical or very a well-reported, well-edited article. All they care about is quantity, not quality. Knowledge@Wharton: You talk in the book about libraries, which aren’t being used as much as they were 20 or 30 years ago. The funding for libraries could be erased in cities across the United States in the near future. Bartlett: That’s quite true. But I think part of the problem is that the libraries themselves don’t advertise very well some of the resources that they have added in recent years. For example, I live in Fairfax County, Virginia. If you go to the Fairfax County library website and put in your free library card number, you have access to many powerful search engines and resources. I can go to a website called ProQuest that gives me free access to The New York Times, The Washington Post, The Wall Street Journal and thousands of other publications that you would otherwise have to pay a great deal of money to access. Things that would never, ever turn up in a Google search. This is a very, very powerful resource for people with low incomes who would like to have access to a quality news source, but they simply can’t afford it. The New York Times costs $15 a month. The Wall Street Journal is $400 a year. I’m not sure what the Post charges. These are costs that are out of the range of a great many people, but they can get them for free if they know where to look. Knowledge@Wharton: How do you think social media companies will need to evolve because of fake news? Bartlett: Clearly, they need to do a vastly better job of weeding out fake accounts. Recently, I wrote something that got me attacked by Russian bots, and I dealt with it by systematically blocking every single one on both Twitter and Facebook. I learned a lot in the process because you have to go to their account page in order to block them. You begin to learn certain characteristics that appear to be in common, such as nothing that’s really personal information, small number of followers but vast numbers of posts. You go to a Twitter feed, they’ll have 1,000 followers and 1 million posts. Clearly, these things are automated. Nobody is sitting there doing these things. And I don’t think it’s that hard. I just think that the media companies don’t want to do it. Knowledge@Wharton: What do you see as the future of the local news? Bartlett: It’s very hard to say, but I think there are some things bubbling around under the surface. For example, my wife and I subscribe to something called Nextdoor.com, which gives us hyper-local information about what’s going on in our neighborhood. This wouldn’t be considered a news source necessarily, but I get a lot of news from it about things that are happening literally in my neighborhood. I think that will survive because people need it, they want it, they’re willing to pay for it. I’m more concerned about things like investigative reporting at the national level, where you have to take highly paid journalists, maybe a whole team of them, and maybe give them a whole year to dig into a story that might only have a few days of play. I don’t know. Knowledge@Wharton: You also take time in the book to talk about academic sources, which is what we use here at Knowledge@Wharton. What are your thoughts on the importance of academic sources? Bartlett: I like them because I think they’re more dependable. Academics have reputations that they have to protect, so they can’t go around spouting complete nonsense, although obviously some do. And any publications in academic journals have to be what’s called peer reviewed, which means that other peers in their field have to sign off and say, “This meets the minimum requirements of technical expertise, statistical methodology,” or whatever else is involved. I find that useful. Google Scholar is just an enormously powerful search engine that will take you to any article that’s ever been published in any academic journal. At least 90% of the time, you can get an executive summary that tells you as much as you probably need to know unless you’re an academic yourself. Knowledge@Wharton: What should people be looking for in terms different sources? Bartlett: You have to follow certain rules that I think people already know. They just have to be conscious of them. One is, a story that’s too good to be true probably isn’t true. Try to double-check things. If nobody else is reporting something that you like because it scores points for your side, double-check it first. You can do that very easily using search engines. If nobody else is mentioning this story, maybe it’s a bogus story. And try to force yourself to have a broad input of sources. Read a few things on the other side. Get out of your silo or your echo chamber, and I think you’ll benefit from that. Fake News, Hate Speech and Social Media Abuse: What’s the Solution? Google, Facebook and Twitter have vowed to fight fake news, hate speech and abuse amid a backlash over how such content may have influenced the U.S. presidential election. The world’s economic system faces five tough challenges. Multilateral institutions offer the best hope of managing them, notes this opinion piece by the secretary general of the European Stability Mechanism.